The 13th Missouri State Militia (later the 5th MSM), under the command of Colonel Albert Sigel, established the post hospital in McDonald's stagecoach stop. Charged with guarding the Wire Road and "clearing the surrounding country of guerrillas", the Union soldiers were kept busy escorting wagon trains on the Wire Road and skirmishes with bushwhackers. 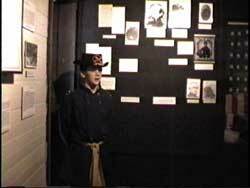 Pictures of the principles and a map of Civil War action in the Ozarks aids in understanding this period. Surviving hospital records for a seventeen month period of the war show that at least 32 men died in the hospital. 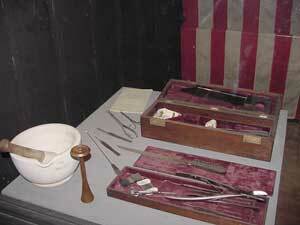 The major amputation kit and other displays relate the maladies/treatment of the place and time in the dogtrot area of the building. 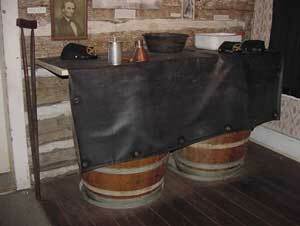 A typical operating table, an interior door on two barrels covered by a gum blanket, is displayed.